Bio Cleaner™ Multipurpose Cleaner with Deodorizer is 100% chemical free, the best multipurpose and ready to use cleaner you will ever need everywhere at home for more effective, cleaner, quicker and easier cleaning. It is used for digesting any organic matter such as grease, grime, dirt, soap scum. Its citrus fragrance and odour neutraliser helps keeping everything fresh and free of unpleasant smells, it also repels flies and insects. It takes out the wellspring of cleaning issues as opposed to just masking it. Its friendly bacteria keeps working upon applications. For optimum results, multipurpose cleaner is most effective when you give it more time to break down organic waste. Use Bio Cleaner with new microfiber cloths and mop heads. DO NOT MIX with CHEMICALS. Available in 500ml, 4L, 10L, 15L, 20L, and 500ml empty bottle. 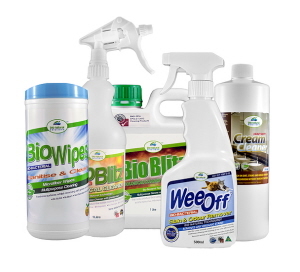 Bio Natural Solutions Eco-Friendly Household Cleaning Kit contains all the essential cleaning products to keep house clean, fresh and green. It is a perfect alternative to conventional and traditional household cleaning products. 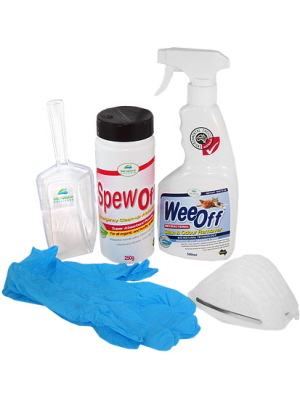 Spew Off Emergency Spills Remover Kit is a cleaning kit designed to remove and clean up organic spills such as vomit, blood, food and drinks.